While the superhero has left Hell’s Kitchen for Harlem, the first season poster of Marvel’s Luke Cage TV show is still a feast for the eyes (and hotter than Hades’ galley). Check it out, above. Luke Cage premieres on Netflix, September 30 at 12:01am PT (3:00am ET on the East Coast). 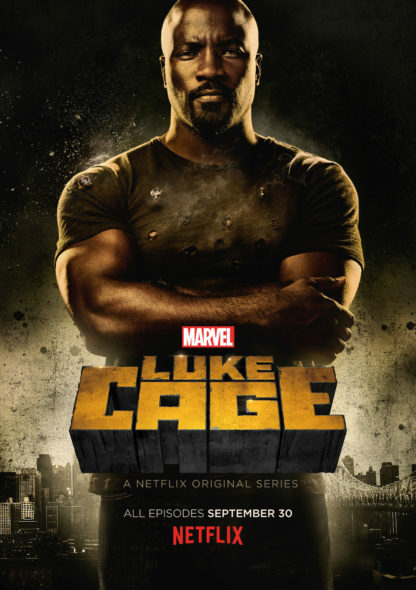 The poster features Mike Colter as the title character, whom viewers met in the first season of Marvel’s Jessica Jones on Netflix, starring Krysten Ritter. Executive produced by showrunner Cheo Hodari Coker, Charles Murray, and Jeph Loeb, Marvel’s Luke Cage TV series cast also includes: Mahershala Ali, Alfre Woodard, Simone Missick, Theo Rossi, Frank Whaley, Frankie Faison, Erik LaRay Harvey, Darius Kaleb, and Rosario Dawson, who first played Claire Temple in Marvel’s Daredevil and has guest-starred on Jessica Jones. The series is set after Luke and Jessica’s relationship has broken up. It is the third of Marvel’s Defenders franchise to hit the streaming service and will lead up to Marvel’s Iron Fist, set to premiere in 2017. While production is slated for this year, no date has been released yet for Marvel’s Defenders mini-series, which unites the heroes of all four shows. What do you think? Do you plan to watch the first season of Marvel’s Luke Cage TV series on Netflix? Which Marvel show are you most looking forward to? Tell us.